Craig Campbell is running for Breckenridge town council. The election for the three open seats will be held April 1. A total of eight candidates have filed to run for three open seats on the seven-person Breckenridge Town Council. The April 1 election is a mail-ballot election — voters can mail in or deliver ballots to town hall at 150 Ski Hill Road. Ballots must be received by 7 p.m. on election day. All registered electors, residing within the corporate limits of the town of Breckenridge, are eligible to vote. Candidates who have filed to run are Eric Buck, Erin Gigliello, Mark Burke, John Ebright and Elisabeth Lawrence. Campbell, 47, has lived in Summit County for the last 14 years and has been a Breckenridge resident for 14 months. He previously lived 1 mile south of town in the Upper Blue region. 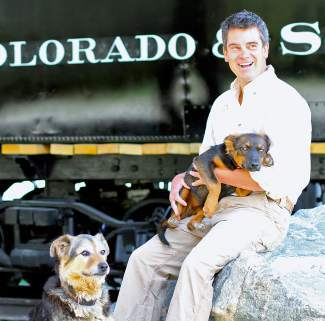 He owns Summit Sustainable Building Co. and has served on the board of the Summit County Builders Association and on the county planning commission. For the last year, Campbell has also worked on the Breckenridge Open Space Advisory Commission (BOSAC). Campbell was motivated by his two children, ages 6 and 9, to run for town council because he wants to help preserve the character of the town for them in the future. Campbell recently completed a certificate in professional sustainability management at the University of Colorado Boulder. He recently attended the public meetings on the Breckenridge Ski Resort summer expansion plan, and said he believes, in general, it would be a good program for the town. He believes his background in sustainability and planning with BOSAC offers credibility and a unique voice to the town council. Craig Campbell can be reached at (970) 389-2848 or by emailing craig@summitsustainable.com. For 35 years, Rockne sold real estate in Summit County, before retiring last year. Her husband, Sigurd, helped lay out the original runs at the Breckenridge Ski Area and operated the first ski school. She has been in Breckenridge since the early 1960s, raising her three children at her home in Warrior’s Mark. Originally from Kingston, N.Y., Rockne said she brings a lot of knowledge about the history of the town to the table. She ran for a town council position about 10 years ago and was not elected. She said she wanted to run again because of all of the big issues coming up with the town. Rockne, 74, wants to make sure the council is considering all possible options when it comes to a new proposal for a second water treatment plant. For 12 years she served on the Blue River Water Board. For Rockne, building and development in the town have been interests for a while. She said she believes in affordable housing, but also preserving land in town for the future. She wants to see a change to an ordinance passed in 2013 that exempts town council from following the land-use guidelines and development codes on town projects. “The town council should abide by the same rules that apply to anyone else who builds in Breckenridge,” she said. Rockne supports finding an alternative solution to the chil-dcare assistance program, not a property tax she said, but perhaps something more like a lift-ticket sales tax. Rockne also would like to see Breckenridge move toward lower property taxes, or even none. Carol Rockne can be reached at (970) 453-0848 or by emailing carol@go2breck.com. 66-year-old Schaetzel, born and raised in Denver, has lived in Breckenridge for five years. He currently works as the currier for Breckenridge Ski Resort, delivering all over the mountain. He and his wife love the summer season, often spending a day out on the bike trails with a picnic lunch. Schaetzel has never run for public office before. He and his wife built their own home in Breckenridge; they have six children and eight grandchildren. Schaetzel said while he doesn’t believe the current town council is doing a poor job, he hopes to be more open-minded and better represent more of the people. He was first inspired to run when, at 4 p.m. one day, he was fighting traffic downtown and thought parking was a problem in Breckenridge that needed to be addressed. He would like to see the F lot turned into a parking garage, for example. With issues such as water, Schaetzel said he wants to understand why the council is thinking about building, “a $100 million water treatment plant; has it really been thought out?” he said. He wants to take more time with those important decisions. Rather than focusing on affordable housing or child care, Schaetzel said he would instead want to make Breckenridge a living-wage community, raising the minimum wage. With his economics background, he also hopes to help the town with its budget and current levels of spending. He also wants to focus on drawing more families into Breckenridge, with more events on weekends rather than promoting a “party-town” atmosphere. Tom Schaetzel can be reached at (303) 524-2775 or by emailing tom.schaetzel@gmail.com.